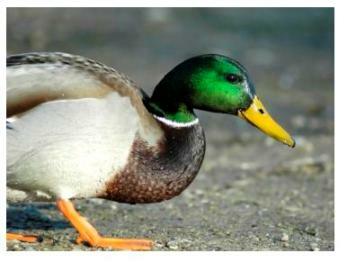 The Mallard is easily recognized and is probably the best-known of all ducks. It is a dabbling duck which breeds throughout the temperate areas of Canada, and is also widespread throughout North America, Europe, Asia, New Zealand and Australia. Along with the Muscovy Duck, it is believed to be ancestor of all domestic ducks today. These dabbling ducks have a wingspan of 32" to 37" and weigh between 2lbs to 3lbs when full grown. During the breeding season, the male has a distinct iridescent green head, an orange-yellow beak and has a black rear end. In contrast, the female is a more drab brown than her flamboyant mate, being light brown with a black tipped beak. Both sexes have a band of blue & black feathers on their wings, called the speculum, which is edged with white, and is prominent in flight or at rest. When not flaunting his breeding plumage, the male becomes a more drab brown, looking more like the female, although still having his yellow beak and reddish breast feathers. During the early summer, these ducks form pairs and stay together, but only until the female lays her eggs, at which time the male abandons her and heads for pastures new and perhaps a new mate! The female lays between 9 and 12 greenish-buff eggs in a down-lined nest which is often just a hollow in the ground, and incubates them for about 4 weeks after which time, the eggs hatch. 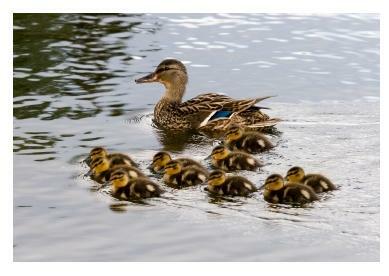 The newly hatched ducklings are "precocial" which means that the young are developed and are not helpless when hatched. They are well capable of swimming and feeding themselves soon after hatching, however, they do stay close to their mother for protection. 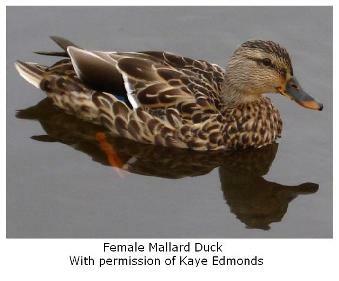 In this area of Southern Ontario, the Mallards are migratory, spending their winters in Mexico, Central America and the Caribbean, often leaving when the weather starts to cool in September and returning the following May. Here you can see the female with her flotilla of ducklings, her blue speculum is clearly visible in this picture. This duck has ten young with her as she keeps them safely close beside her away from predators such as herons, and even large fish such as Pike. On land, the ducklings are at risk of predation by foxes and large birds such as Hawks and Eagles. Human hunters also take their toll of these birds. In flight the adult ducks are safe from most predators except the Peregrine Falcon which has the strength and speed to catch a duck in flight. 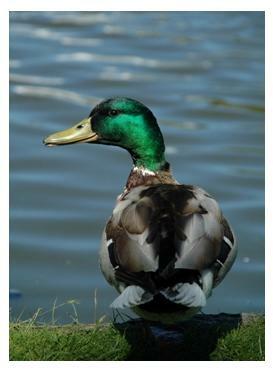 These ducks feed on aquatic vegetation and invertebrates, seeds & acorns, grain, insects and larvae.